When not writing about her imaginary friends, Carol Moncado is hanging out with her husband, four kids, and a dog who weighs less than most hard cover books. She prefers watching NCIS to almost anything, except maybe watching Girl Meets World. She believes peanut butter M&Ms are the perfect food, and Dr. Pepper should come in an IV. When not sitting at the pool or watching her kids – and the dog – race around her big backyard in Southwest Missouri, she’s teaching at a local community college. 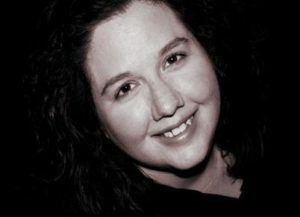 She’s a founding member and President of MozArks ACFW and blogger at InspyRomance. I’d known I wanted to write a story for Lifeguard Adam since last year! 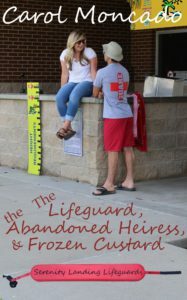 His heroine was completely new to me, but when she started protesting about the little kids “just not drowning” on swim team, I knew Adam would have to show her – and the kids – that they could do it on their own. All they needed was a little practice and encouragement. She nodded, breathing heavily, and clung to the grate over the gutter. 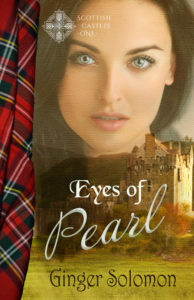 With wide eyes, Audra jumped holding her nose. They’d get to non-nose-holding dives when they were a bit older. Much the same as her twin, Audra made it to the other end of the pool with Isabella and Katie yelling encouragement the whole time. Katie did even better, but she was a bit older than the twins. Alyssa surpassed them because she had the benefit of an indoor pool at home and Alivia as her nanny. Her swim resembled actual freestyle more so than any of the others. One more. Lorelai had arrived with Gwendolyn and Alyssa. What was that about? Lorelai, though, looked more scared than the others had been. Her head dipped part way under water for the first time since she “dove” in. “Keep swimming. Just like Dory,” he encouraged. “I can…” She dipped under again, this time getting a mouthful of water. I love this version of Adam here. So like God. Keep our eyes on Him and not how far away the wall is and He’ll help us get there. The Lifeguard, the Abandoned Heiress, & Frozen Custard will be available June 28 in the Whispers of Love boxed set! Available in the boxed set Whispers of Love. I had the privilege of pre-reading this story and loved it. I think you will, too. Thank you for having me, Ginger!